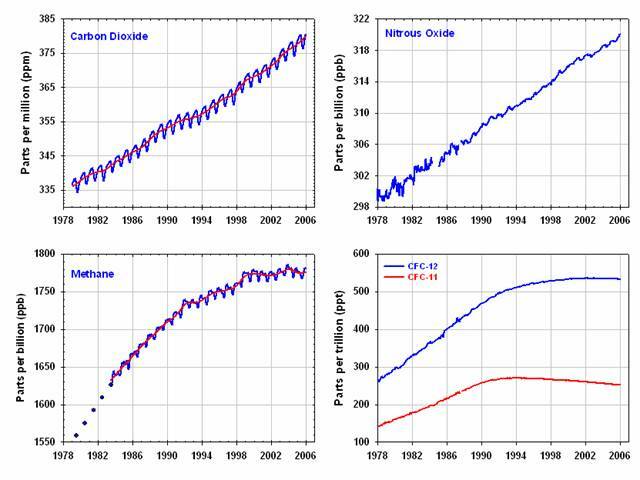 Global averages of the concentrations of the major, well-mixed, long-lived greenhouse gases, carbon dioxide, methane, nitrous oxide, CFC-12 and CFC-11 from the NOAA global flask sampling network since 1978. These gases account for about 97% of the direct radiative forcing by long-lived greenhouse gases since 1750. A recent study, led by Frank Keppler from the Max Planck Institute, found that plants emit significant amounts of methane, a potent greenhouse gas. Does this research call into question the value of carbon sequestration from trees and plants as a climate change mitigation strategy, or is this speculation as overblown? What did the research really say? What do scientific experts think about its significance? In response to the publication of these papers and the confusion and questions they and the press surrounding them generated, the Nicholas Institute for Environmental Policy Solutions at Duke University convened a group of experts to evaluate the research and its implications. In the Nature paper, Frank Keppler and his coauthors report on a previously unmeasured source of methane emissions - living plants and their fallen leaves. Methane is a potent greenhouse gas, with a warming potential 23 times greater than carbon dioxide. At first glance, Keppler’s paper suggests the need to reassess the value of biological carbon sinks. If living plants are emitting methane, the benefit gained by planting or replanting forests to sequester carbon could be countered by the release of methane from the trees. 1. What did this new research by Keppler et al. say? In their research, Keppler and his team measured methane emitted from plants and leaves in a laboratory. The discovery of this previously undetected source of methane and an unknown mechanism for methane production was met with some surprise and significant interest among the scientific community. The authors’ admittedly rough estimate of how much of the annual global methane emissions could come from this previously unmeasured source, 10-30%, was surprisingly large and generated much of the concern and confusion surrounding the publication of the article. A crucial underlying fact about this research that was mischaracterized in some of the press coverage is that this source of methane is not a new phenomenon. However, scientists had never identified it, distinguished it from other sources, or included it as an identified source in global methane budgets. Although existing uncertainty in the budget provides room for an unidentified source, that this previously undetected plant-produced source could be as large as calculated by the authors gave rise to skepticism among some scientists. Balancing the sinks and sources of methane, with Keppler et al.’s estimates, would have required that other sources of methane have been overestimated. Keppler and his coauthors were the first to detect methane emission from a wide variety of plants and their fallen leaves. They were the first to try to quantify this flux from plants and the first to try to understand this new mechanism of methane production. Scientific discovery is an iterative process. While they have taken the very first step and discovered a new phenomenon, much research still needs to be done before we will know enough to incorporate this new methane flux into greenhouse gas mitigation planning and accounting. While Keppler and his coauthors used their laboratory findings to calculate global methane estimates from plants and found these estimates to be fairly large, they did not suggest major policy implications for their results. In contrast, the science news and general press made broad generalizations, often in the headlines, which led to a misinterpretation of the research suggesting that the benefit of forests for carbon storage could be substantially reduced based on the results of this study. The authors themselves felt this was a misinterpretation of their results and replied with a press release from the Max Plank Institute clarifying their results. While the participants accepted that plant methane emissions were likely measured by Keppler and his coauthors, there was a general sense that these results should be replicated and validated through further experimentation. Other recent scientific research may lend some support to Keppler’s findings of methane production from plants. A number of measurements in the Amazon suggest that the concentration of methane that accumulates in the forest canopy and the atmosphere above the Amazon region is too high to be easily explained by the sources usually considered. These studies may provide support for Keppler’s observations of methane emissions from plants, but are not detailed enough to help quantify them. Participants in this discussion also noted that Keppler showed no consistent differences in methane emissions from different kinds of plants. Measured methane emissions from grasses and trees were variable and overlapping. 2. Should the emission of methane by plants, as described in Keppler’s paper, change current or proposed policies for land use projects designed for the sequestration of carbon? The answer is no. Keppler’s paper does not add a new methane source; rather it better defines what is in the uncertainty of current global measurements. The reduction in sequestration benefits from methane emissions from plants may be in the range of 0.4%, based on our discussion, or 4% based on the authors’ original calculation. In either case, it would likely make little difference in current policy design and, based on the precision in accounting methods it would likely have little significance for individual projects. Furthermore, in most terrestrial sequestration projects, trees replace grasses, shrubs, or crops. In Keppler’s study they show no clear difference between the emissions from grasses and those from trees. There is no indication that a plantation would emit more methane than the grassland or other land cover that it replaces. With the development of a carbon market under the Kyoto Protocol (KP) and the potential of a carbon market or carbon policies in non-Kyoto countries like the United States, land-use based sequestration offset policies are being developed around the world. Some of these are internal to a country, for example, Articles 3.3 and 3.4 of the KP and the U.S. voluntary registry; and some exist between countries, such as Joint Implementation and the Clean Development Mechanism (CDM) under the KP. These policies are all still relatively new constructs. * Plants appear to be a previously undetected source of methane. Using the estimates in the published study, the methane produced by a forest would reduce the carbon sequestration climate benefits by about 4%. * The group gathered at Duke suggested refinements to the global estimate that would reduce the methane flux by a factor of 10. If future research finds this reduced estimate to be closer to the actual flux, the methane produced by plants would be only a small fraction of the global methane budget. * More importantly, it is likely that no change in the sequestration climate benefit will be observed. The measurements in the study could not distinguish if the magnitude of methane emissions from trees is any different from that of grasses. Thus, we do not know whether replacing grasslands with forests will increase, decrease, or have no net effect on methane emissions. * Irrespective of whether the original estimated fluxes are used or those suggested by this consensus group, the impacts on carbon sequestration benefits of forests are quite small. Methodologies typically used to assess the greenhouse gas benefits of carbon sequestration are sufficiently comprehensive and sophisticated to incorporate the impacts of methane emissions. Chicago Climate Exchange (CCX) announced that the total trading volume of CCX Carbon Financial Instrument contracts in May was 2,435,400 metric tons carbon dioxide. This doubles the total April 2006 volume of 1,069,400 metric tons of CO2 making it the highest monthly trading volume to date and the first month to break the mark of two million tons traded. Total trading volume in the first half of May also surpassed the total trading volumes for 2004 and 2005. The highest single day trading volume record for CCX was set on May 15, 2006 when 698,000 metric tons traded, surpassing the previous record established on May 11, 2006 of 561,900 metric tons. Trading during May occurred in all vintages from 2003 through 2010. (See May 15, 2006 CCX Market Summary below). Cumulative trading volume since December 2003 is 8,480,000 metric tons of CO2.